Quirks in ‘Oumuamua’s path through the Solar System helped researchers solve a case of mistaken identity. The first-known visitor from outside the Solar System, an object dubbed ‘Oumuamua, is an icy comet rather than a rocky asteroid. New measurements help to confirm early guesses as to the composition of the interstellar interloper, and could also aid researchers in their hunt for similar objects in our Solar System. Careful observations of ‘Oumuamua’s orbit showed that as the object flew through space, something continually nudged it a tiny bit farther from the Sun than expected. That something was probably ice that warmed up and sprayed gas into space. This process is characteristic of a comet, rather than an asteroid, even though ‘Oumuamua never displayed the glorious tail of gas and dust that accompanies most comets. “It’s an unusual comet, and that’s pretty exciting,” says Karen Meech, an astronomer at the University of Hawaii in Honolulu. She and her colleagues, led by astronomer Marco Micheli of the European Space Agency in Frascati, Italy, report the discovery on 27 June in Nature1. The finding supports earlier hints2 that ‘Oumuamua resembles a ‘baked Alaska’ dessert, with a frozen heart and warm exterior, says Michele Bannister, a planetary astronomer at Queen’s University Belfast in Northern Ireland. Astronomers discovered ‘Oumuamua on 19 October 2017 using the PanSTARRS-1 telescope on the Hawaiian island of Maui. Within hours, they could tell its trajectory was unlike that of any other known celestial object, suggesting that the interloper must have come from beyond the Solar System. In Hawaiian, ‘Oumuamua means “a messenger from afar arriving first”. But by the time scientists spotted it, the visitor had already flown past the Sun and was on its way out of the Solar System. Telescopes around the world strained to follow ‘Oumuamua as it grew fainter and disappeared among the stars. 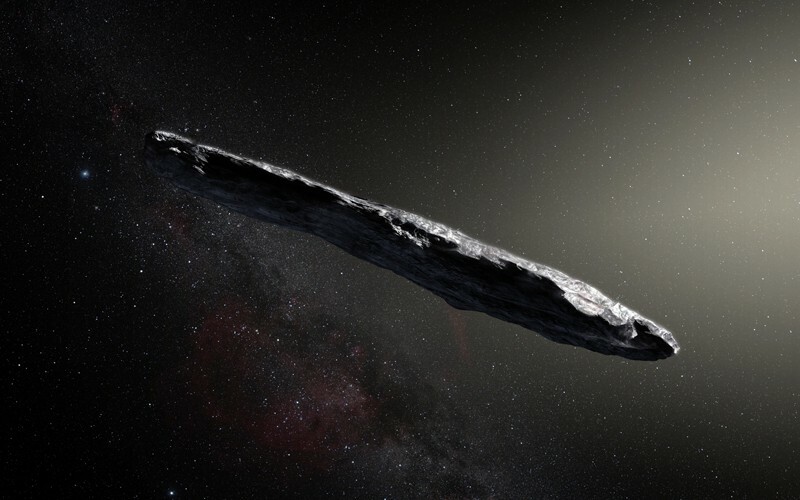 Since astronomers couldn’t see a characteristic comet-like tail extending from it, most categorized it as an interstellar asteroid3. Other observations, however, hinted that the object could have an icy interior beneath its desiccated surface2. Using the Canada–France–Hawaii Telescope in Hawaii, the Very Large Telescope in Chile and the Hubble Space Telescope, Micheli and his colleagues traced the visitor’s path from late October until early January 2018. By plotting ‘Oumuamua’s position against the stars, the scientists saw that it was travelling in ways that could not be accounted for by the gravitational tug of the Sun, the planets, the Moon and other major bodies in the Solar System. “As it moved away from the Sun, it was slowing down a little bit less than we would have expected,” says Meech. The magnitude of whatever was affecting it was tiny — just one-thousandth as strong as the pull of the Sun’s gravity. After considering other possible explanations, the researchers concluded that the effect comes from comet-like outgassing. As ‘Oumuamua approached the Sun, it began to heat up, and its icy heart started to melt. This released gas that made its way to the comet’s surface and shot outward, giving the object a little push. The outgassing rate is small compared to what typical comets experience, says Jessica Agarwal, an astronomer at the Max Planck Institute for Solar System Research in Göttingen, Germany. ‘Oumuamua also emits relatively little debris, perhaps because its dust particles are too large and heavy for the weak outgassing to carry aloft. That could explain why ‘Oumuamua never developed a visually stunning, comet-like tail. This invisible outgassing could inspire researchers to look for similar objects in our own Solar System, says Henry Hsieh, who studies asteroids and comets with the Planetary Science Institute in Honolulu, Hawaii. When it comes online in 2022, the Large Synoptic Survey Telescope in Chile might be able to spot some of these stealth comets. Micheli, M. et al. Nature https://doi.org/10.1038/s41586-018-0254-4 (2018). Fitzsimmons, A. et al. Nature Astron. 2, 133–137 (2018). Meech, K. J. Nature 552, 378–381 (2017).